GDPR is officially here. Your inboxes are supposedly free of spam.Social media is awash with celebrations as the General Data Protection Regulation rules come into effect, giving the public more rights over how personal information is used.Companies have been emailing their users for weeks, asking permission to continue to send them emails.But some people have seized the opportunity to purge their inboxes and have taken to Twitter to celebrate the lack of unwanted mail - including Radio 1 DJ Nick Grimshaw. Grimmers is just one of many popping champagne at the dawn of a new, spam-less day, with Kirsty Craig claiming her inbox has "never been so empty", and James Melville describing his inbox as "released from being held hostage". But for some, things are unchanged as their inboxes remain stacked with unwanted communications - with many about GDPR itself.Blogger Fred Wilson called it "a bit ironic" that GDPR had led to so many emails landing in his inbox, and comedian Adam Hills joked that he preferred it "when they just harvested my data".Some likened the situation to unprepared students, "doing your homework on the bus on the way to school", and another saw it as akin to university essay pressure. Meanwhile, some drew attention to companies which supposedly contravened GDPR rules in the process of trying not to.When emailing their subscribers to inform them about GDPR, some companies inadvertently included the contact details of everyone on the mailing list in their email - thus accidentally giving away personal information to their subscribers.Art historian Bendor Grosvenor called it "peak GDPR" as he received the personal email addresses of 462 people and Jon Pratty jokingly asked if anyone wanted to buy "a good arts contact list".And one person saw the new rules broken in a different way - with an event she attended about GDPR giving her no indication of how they intended to use her email address. GDPR also seemed to inspire a funny response from artists, as a series of cartoons and comics popped up to mock and explain the new personal data rules.In one widely shared comic by Mark Anderson, a pupil asks his teacher to explain how she intends to use his data before he writes his name on a board, while Telegraph cartoonist Matt wondered how the Ancient Greeks would have dealt with GDPR.TwistedDoodles imagined the series of emails as the end of a relationship. 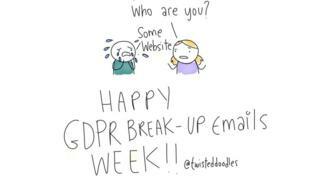 John Hazard and Lisa Burdige suggested GDPR might affect job-hunting, while even the European Commission tweeted some Pierre Kroll illustrations to help show "the challenges of protecting personal data".And just in case you're still struggling to understand what GDPR really means, Manchester DJ Mr Scruff put together a comic to help it all make sense.